You are currently browsing the archives for the Elaine Zimmer Davis’ Vietnam Travels category. L-R: Du’s son, Vinh; granddaughter, Thao; grandson, Nguyen; daughter-in-law, Huyen; Elaine; wife, Yen; and Du, have graciously opened their home to me on several occasions. 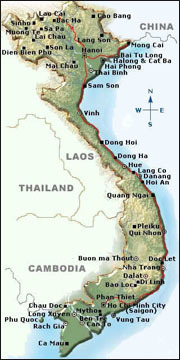 It has taken me a while to realize that my visits to Vietnam have been a positive factor in the constant challenge of reliving Jerry’s death while working on his case. Certainly the in-country JPAC leadership and field teams, working hard to find our loved ones, have provided a comfort zone and connection to people of like mind and culture in this faraway country. However, my transformation seems to have come gradually from people of so-called unlike mind and of a very different culture. 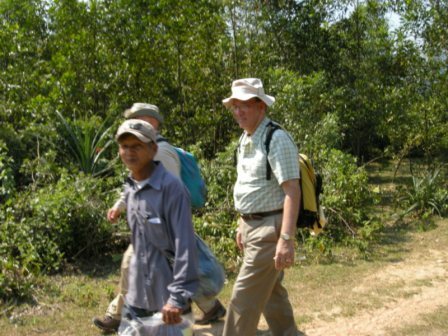 Former Army officer and Vietnam Veteran Doug Reese is shown here in 2009 with Mr. Du, a Viet Cong during the war, who helped us find Jerry’s and Al’s crash site. Although now living in the USA, Reese continues to be a reminder that contacts in Vietnam are important — especially for travelers like me, who often go solo. (Partially shown in this photo is retired Lt Col Gene Mares, USMC, whose efforts also helped us convince JPAC that we had found Jerry’s site). Maneuvering the MIA world is not easy and sometimes elevates grief to a whole new level. And certainly the quest to locate and repatriate Jerry’s remains in Vietnam has been extraordinarily challenging at times. However, I am a strong believer in trying to balance sobriety with humor and have found that my endless travel glitches – particularly when I go solo — keep the yin and yang in check. Undoubtedly, my preparation for traveling solo in Vietnam began nearly two decades ago, as a freelance writer covering the port of Yantai in mainland China for a business publication. Although China was developing rapidly, especially in the economic zones, the country was vastly different than it is today with no Internet access or mobile phones, bicycles everywhere and few English speakers to be found. Furthermore, I knew nothing about maritime commerce, shrimp farms, refrigerated containers and the list goes on. I was truly a fish out of water! Despite being lackluster, my article was published; however, had I submitted the real story, it would have been anything but boring. A quick sample: Asked to make a toast at a formal dinner, hosted by the Mayor of Yantai and about 12 of his male colleagues, I selected a Spanish toast that unbeknownst to me translated into “Kiss – Kiss” in Mandarin, instead of “cheers.” When everyone began laughing, and it wasn’t supposed to be funny, I knew something was wrong. Although two decades have passed since that toast and trip, I learned a valuable lesson: Don’t assume that everything translates the same from one language to another. Thanks to my friend, Doug Reese, an Army Vietnam veteran and long-time in-country travel expert who has made incredible contributions to Jerry’s case, I have avoided many of my past mistakes –but not all — while traveling in Vietnam. Although Doug recently moved back to the United States with his Vietnamese wife, Nhung, and their daughter, Samantha, we stay in close contact. A master at communication, Doug always manages to track me down through his Skype connection, and my recent trip to Vietnam was no exception.